The Mississippi River, which both unites and divides our communities, has been crossed by a ferry since the earliest times. Both George Davenport and Antoine LeClaire offered ferry service as early as 1825. In 1837, LeClaire sold his ferry to John Wilson, who began a family dynasty that controlled the Rock Island-Davenport water connection for decades. 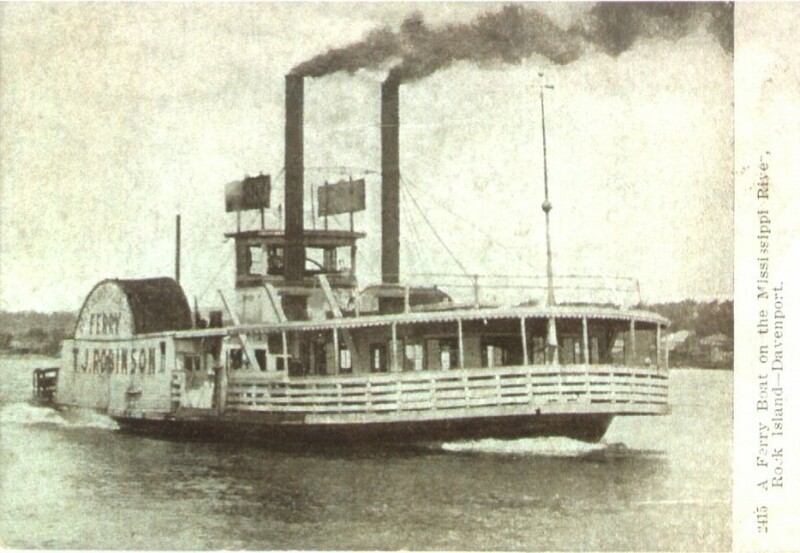 Wilson introduced the first steam ferry to the area, which he called the “John Wilson” after himself. When Wilson died in 1852, ownership of his ferry company passed to his son-in-law John Spencer, who continued the ferryboat operation between Rock Island and Davenport. Then Thomas J. Robinson entered the picture. Stories about T. J. Robinson are not always consistent, but we’ll try to sort them out. Some accounts say that T. J. Robinson purchased Spencer’s interest in the company; others say that Robinson was a partner of Spencer and inherited his shares from Wilson as well. This theory is based on the premise that Robinson was married to Spencer’s daughter (Wilson’s granddaughter). However the truth is that T. J. Robinson was married to Amy Henderson, while Julia Spencer was wed to Dean Tyler Robinson, a member of a completely different local family. At any rate, Robinson, soon became the active manager of the ferry, thus gaining the title of Captain, by which he was known thereafter. In addition to the ferryboat company, Captain Robinson became an organizer of several companies including Rock Island Glass Company and Illinois Watch Company. He also was a founder of the Rock Island National Bank in 1871. The ferry “John Wilson” was later replaced by the “Davenport” which was then followed by the “Rock Island.” The latter ferry operated for a long time between the two cities until being replaced by the “J. W. Spencer,” which in turn was replaced by the “Augusta.” Then came the “T. J. Robinson,” which was put into service around the turn of the 20th century. The boat, which had originally traveled between St. Paul and Minneapolis, was completely overhauled and rebuilt to the “finest condition” before being renamed in honor of Captain Robinson, who had died at age 81 in 1899. It was put into service between Rock Island and Davenport, making a trip every 15 minutes during the day. Patrons also enjoyed riding the ferry for a longer time especially “to catch the river breezes” during the summer, so hourly rates were charged for these extended cruises. The first captain of the “T.J. Robinson” was Marcus Henderson, Mr. Robinson’s nephew. Captain Henderson was also a stockholder in the ferry company, which had been bequeathed to him by his cousin, Frank J. Robinson, in 1902. Notice how the postcard shows a strong wind blowing the smoke from the stacks nearly horizontal as the sidewheeler churns the water to make its crossing. Can you imagine Capt. Henderson up high in the pilot house, steering this ferry across the river? The ferry is unadorned and relatively small, with only one level for its riders. Since crossings were so frequent, a large capacity was not necessary. The ferry landing in Rock Island was located at the foot of 18th Street, where a brick levee (levee here meaning a boat landing rather than an anti-flood embankment) sloped gradually into the water. After operating ferries for nearly a century, the ferry company passed out of the Wilson-Henderson family continuum in 1925, when it was sold to W. J. Quinlan. Quinlan’s boat, named for himself, was a more ornate two-story vessel, matching our image of what a riverboat should look like. The Quinlan ferryboat is still fondly remembered by many, either as an operating ferry or as a derelict beached in the old Kahlke boatyard on the riverfront between 7th and 13th Avenues. The Quinlan crisscrossed the river until 1946, when a ferry was deemed unnecessary, perhaps because of the easy river crossings offered by the new Centennial Bridge. But it is harder to “catch the river breezes” on a warm summer’s eve now than it was on a ferryboat ride across the river. This article by Diane Oestreich is slightly modified from the original, which appeared in the Rock Island Argus and Moline Dispatch on April 28, 2002.